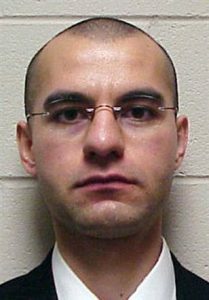 In March 2006, Iranian-born muslim Mohammed Reza Taheri-azar intentionally drove his rented jeep into crowd of students in the “pit” on the University of North Carolina campus. 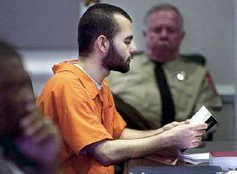 He was charged and convicted of nine counts of attempted first degree murder and sentenced to 33 years in prison. He seems pretty clear about his motive. If you notice the photo of Taheri-azar before he declared himself a jihadi, he is clean shaven. 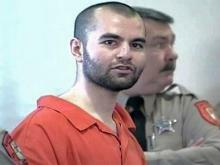 Once he committed the act of jihad, he began growing out his beard – nothing to hide any more. Jihads always tell us why they do what they do. Officials in this case said Taheri-azar violated North Carolina law and nothing more. According to police and prosecutors, Taheri-azar acted alone and, therefore, once convicted and sentenced, no more work needed to be done. So, for all of the mosques/Islamic centers teaching jihad and training jihadis in the Triangle area of North Carolina – keep doing what you are doing. No one cares. And this exactly what is happenning ,not only in in Colleges, is happening in front of our eyes in our public schools. School administrators following the policies of globalist agendas in their districts repeat again and again: these parents look good to me they are very nice,they always smile to me,etc,etc, This simplistic approach is only sign of their ignorance about the mission of political islam. Thank you for this Mr. Guandolo I will make sure to LOOK OUT carefully for a potential threat. Thank you again for helping protect the U.S. And Never Stop Please. John Guandolo is great, knows Islam to a “T”! When you look at what has happened to Italy, Germany, Sweden, England, it is absolutely bewildering to me that the people sat back did nothing, said nothing, and now look at them & the mess they have with all those supposedly refugees flooding in. THIS IS NOT ABOUT BEING A RACIST! The problems that come from allowing & bringing in ALL this people is REAL, and it will have a very big negative effect on the countries & peoples for sure. But, for some reason we have STUPID people that want to be blind to it and except any & all that wash up on our shores. What country can afford the overwhelming financial burden of supporting all these people as well? It is to much to ask us the tax payers to foot this kind of bill in the name of humanity, sorry but NO… Those people need to stay in their own country figure out their own problems, not become a problem for another country. There absolutely needs to be a halt to immigration from anywhere, we have enough in the so called melting pot of USA. The current politically-positioned Sheriff of Clark-county, Nevada assumed office in 2015 with the support of the (then) Nevada Attorney General. Inasmuch, therefore, by virtue of said election he also heads the Las Vegas Metropolitan Police Department, which thus statutorily immunizes him from any contextually direct control by either State or federal entities, he has been able by virtue of said absolute unquestionable anomaly to control the narrative to successfully feign perplexity with respect to his bogus law-enforcement irrelevancy of wondering “why” an obvious sharia-adherent convert to Islam would commit in abeyance to the Koran the 2017 Mandalay Bay Hotel massacre in Las Vegas. I.e., by virtue of his conversion he was obliged to wage war* on “infidels” (non-Muslims) to thus advance the 14-century quest for global dominance by Islam. Furthermore, it isn’t the mission of a law-enforcement entity to divine “why” sharia-adherent Muslims are killers, since “who, what, where, when and how” are the only demonstrably factual answers which exist. Furthermore, with respect to said sheriff’s law-enforcement proclivities, its important to note that 6 months after assuming office he began the decentralization of a detective unit dedicated to the control of criminal gangs and 8 months on attributed the inevitable 50% increase in Las Vegas crime due to his personal malfeasance to a political initiative referred to as “Proposition-47” which related exclusively to overcrowding in California’s prisons. Too, it would enhance the personal safety of Las Vegas residents to familiarize themselves: a) with the definition of “truth”, which is simply the state of not being hidden, (thus the opposite of truth is “concealment”), and b) accusations of so-called “conspiracy theories” are the alibies corrupt politicians use, more often than not, to ride-out the statutes of limitation relating to the crimes they commit. I.e., said Sheriff is ostensibly more interested in creating an illusion of serenity and peace in Las Vegas so as not to diminish the influx of international high-rollers there, rather than protect & defend all others as presumably mandated by the routine oath American law-enforcement entities in the State of Nevada commonly require. Parenthetically, its important to note, notwithstanding widespread confusion, that the “National Sheriffs’ Association” per se is not a law-enforcement entity, its a trade organization founded and funded by businesses who are focused on a. federal & domestic industry which by virtue of the essential services they provide to the American people are perpetually in the market for the “tools of their trade”. Currently the NSA is comprised of what it refers to as 21 “Platinum Partners” & 16 “Silver Partners” who by virtue of product exhibits sponsored by NSA (one of which is scheduled to be held In Hennepin County Minnesota in the not too distant future (think Minneapolis-St. Paul) the purchasing agent which each American Sheriff has is thus enabled to place accoutrements orders with said NSA, largely Hi-tech, providers for whatever they need. The downside of NSA’s otherwise essential contribution to national & domestic security and the garden variety of first-responder steps required to protect “life & property” whenever need be, the NSA apparently regards UTT’s staff of unsurpassable experts to whom with respect to the lethal threat CAIR/Hamas and a literal laundry-list of other Islamic terrorist organizations pose to the United States, the NSA is a naïve reckless amateur which judged by its actions believes that since the enhancement of national security in time of war poses a threat to their lucrative profits, UTT speakers should be collusively undermined and denied access (most recently, e.g. to the Amherst county, Virginia Sheriff’s facility and an educational institution in Nashville, Tennessee). *The blog I posted on 21 January 2018 at 1552hrs (above) should have included the following reminder: Anyone wishing to obtain a personal Arabic-to-English-translation of Islam’s verbatim declaration of war on the United States, which was seized in 2004 from a subterranean basement in Annandale, Virginia by Special Agents of the FBI in compliance with a federal search warrant, may do so (for a nominal handling & postage fee) via: http://www.securefreedom.org to request – GOVERNMENT EXHIBIT 003-0085 3:04-CR-240-G U.S. v. HLF, et al. Thank you Mr. Klein for this very thorough information of Nevada Officials. I’ve been meaning to get a copy of the Memorandum. I will be passing the formation forward to other Law Enforcement, because I don’t think that many of them know about this or their superiors may not know about the Memorandum. The Obama Admin, (Including Mueller) forbid the disclosure. Fortunately there are people like Gaffney, Guandolo, Gabautz, Hanley, Hansen, Shideler, Lopez, Fleitz, Chang, Chris, Clarion, yourself and so many others who are Sharply Awake! I knew this was happening Decades ago, but thought it was just my imagination. Thank goodness I did listen to my imagination.